The ‘A’ Class Catamaran Worlds ended with a day on the beach for the sailors. 50deg windshifts, coupled with 28kt gusts from the SW finished the 2017 championships. With a similar power to weight ratio as a Moth, these 75kg carbon machines have a class limit set to 22kts for obvious reasons. A few sailors, who could have improved their positions, would have been willing to sail, but only Manuel Calavia (ESP) could have had a mathematical chance of catching him. Hence Stevie Brewin was crowned 2017 World Champion, his third world title, since wining in Denmark 2011 and Spain 2001. Only Glenn Ashby has won the title on more occasions. Also on the Podium were the two local Polish top guns, Tymuk Bendyk and Kuba Surowiec. 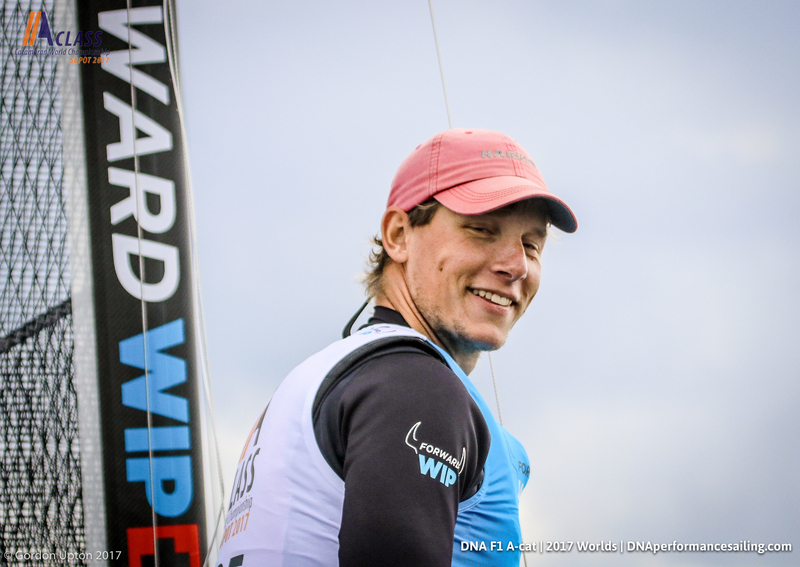 The pair sailed superbly, constantly fighting for positions each day and each was genuinely happy for the other’s result. 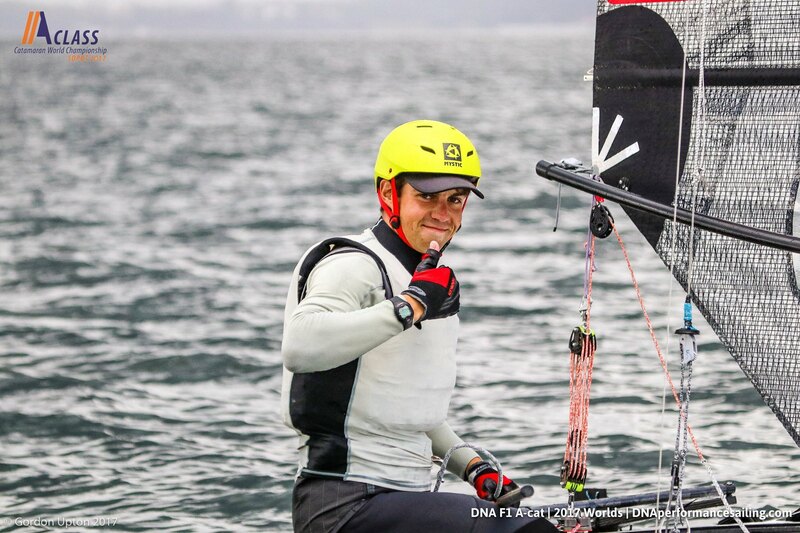 They were closely chased by Dave Shaw (NZL), Darren Bundock (AUS) and the event organizer, Jacek Noetzel (POL), but a spectacular race in the light stuff on the Thursday effectively destroyed their chances in the end. Only Manuel, who had he not had an OCS on the second race, would have been right up there. He is destined to be World Champ if he continued to sail like that. This was a very strong fleet indeed, the strongest seen for several years. This year was the first regatta for a few years that was not dominated by just one or two sailors. 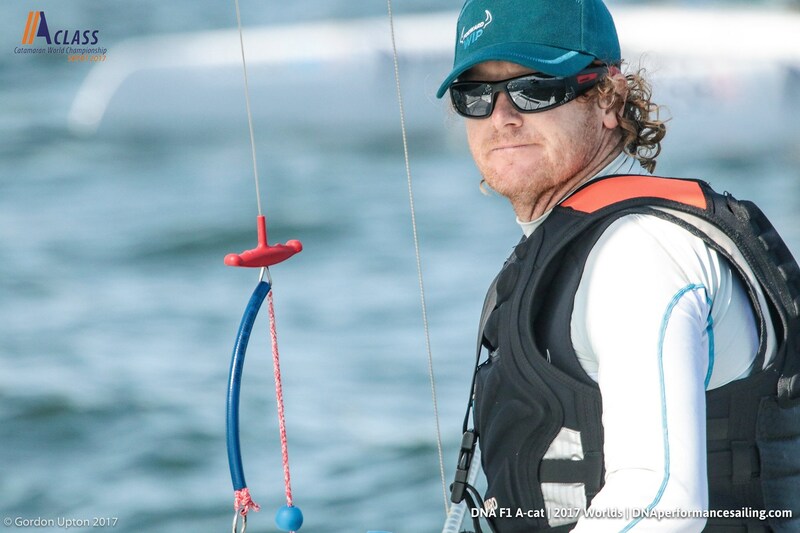 2015 saw the Ashby/Heemskerk showdown, where Glenn dominated with his light wind foiling skills that Mischa couldn’t match. 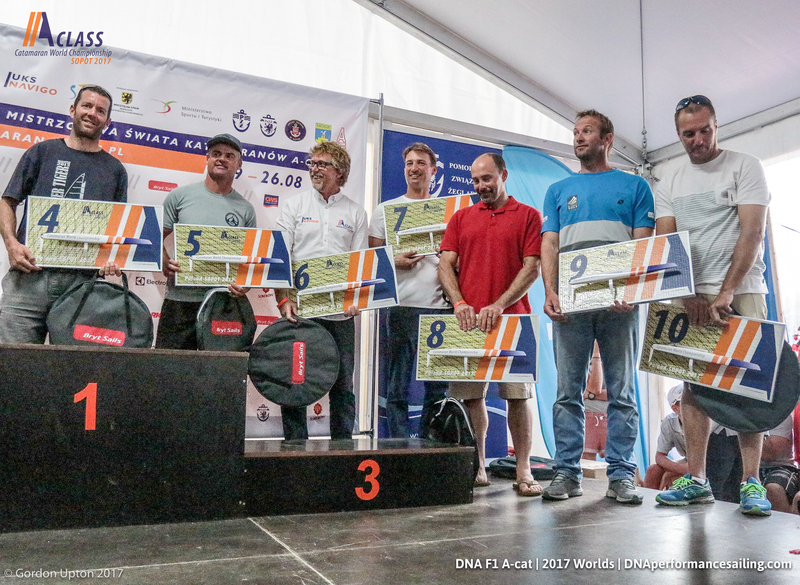 2016 was the Misha Heemskerk show, where, armed with the new DNA F1, he took a clean sweep. But this year, it was a real battle for the championships. The conditions ranged from races in shifting 5-6 kt winds requiring the strategic skills of a chess grand master, to a day of full on adrenalin fueled action in 17-19kt wind and in big waves. We all have favorite conditions. The Bavarian lake sailors love the tactical light stuff. The Aussies love the big winds, and are starting to use cut down rigs to lower the centre of effort, something needed on the new breed of foiling boats. But the test of a real top class sailor is to come out on top in all these conditions, not just to excel in one. This is where Sopot was so good by throwing everything at them for the whole series. The Polish Exploder boats dominated the event, as expected. They had 9 of the top 10 sailors on their Exploder Ad3. Only Mischa carried the flag of DNA. However, as last year was in the DNA back garden, this was to be expected when this year it was in the Exploder’s one. 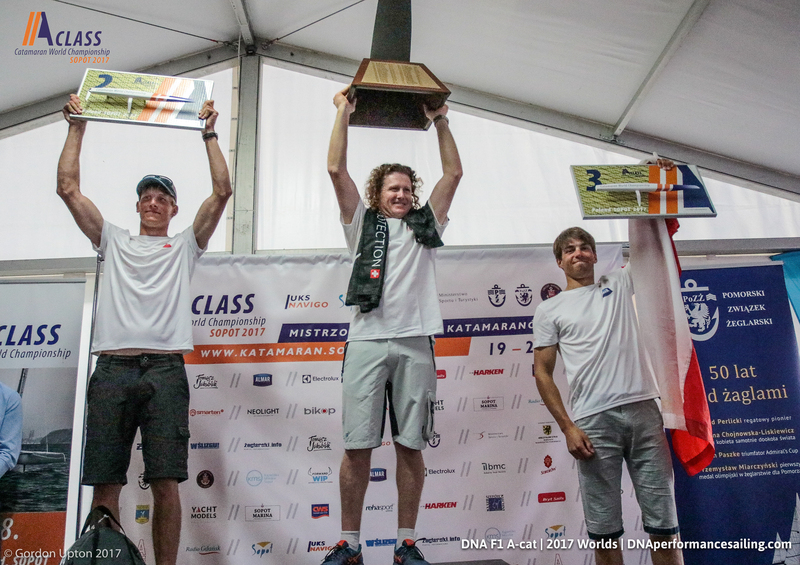 The Classic (Non-Foiling) ‘A’ Class champion was won by Pontius Johnson (SWE) on his Marstrom. He actually finished 25th overall, so no mean feat. The Classic division was officially adopted into the International A-Division Association (IACA) as a distinct version of the ‘A’ Cat at this years AGM and avoided splitting the association. Many counties now happily run parallel results and rankings for this variant, usually all racing on the same start and courses. The majority of A ‘Cats out there are Classics. The regatta was the first major event staged by the UKS Navigo Club in Sopot. The organisers pulled out all the stops and nothing was too much trouble for them. The town was festooned with banners for the event. Even Sopot’s famous pier had a big screen with some live feeds and video of the ‘A’ Cats in action. Aside from the good club catering, they had a mobile kitchen set up and run by a couple of the most famous Polish TV chefs! Imagine of Jamie Oliver did your regatta catering?! Their food can only be described a truly awesome. 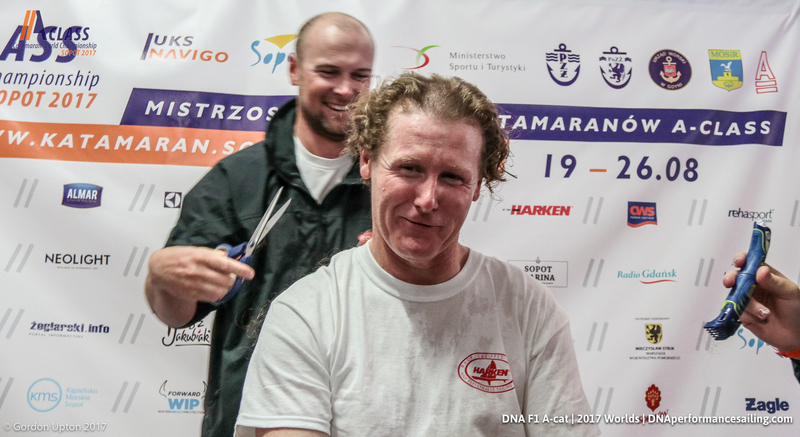 At the ceremony, Stevie recieved his traditional haircut, after saying he do it on stage if he won the worlds. 2 years growth was removed, sheep-shear style! The whole circus has now moved on to Hervey Bay in Australia – https://www.sailherveybay.com.au in Nov 2018. Then it’s in Weymouth in 2019, so get training. Many thanks to all the staff and volunteers at the UKS Navigo club. Medals all round. Also, thanks to the event sponsors - Harken, Bryt Sails and Forward WIP.